Mumbai: The share swap ratio of a three-way bank merger of Dena Bank and Vijaya Bank with Bank of Baroda (BoB) was announced on Tuesday, as they took a step closer to becoming the third-largest lender in India. BoB, the largest of the three banks, on Wednesday said that shareholders of Vijaya Bank and Dena Bank could get 402 and 110 equity shares of BoB for every 1,000 shares they held. 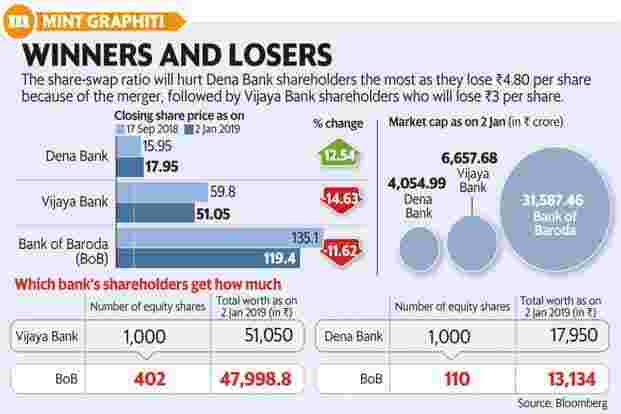 A Mint analysis shows that the share swap ratio will hurt Dena Bank shareholders the most as they lose ₹ 4.80 per share because of the merger, followed by Vijaya Bank shareholders, who will lose ₹ 3 per share. The calculations are based on the closing market price on Wednesday. While BoB closed at ₹ 119.4 per share, Vijaya Bank and Dena Bank closed at ₹ 51.05 and ₹ 17.95, respectively. Meanwhile, PTI reported on Wednesday that the Union cabinet has approved the merger of the three banks. The government owns 68.77% in Vijaya Bank, 80.74% in Dena Bank and 63.74% in Bank of Baroda Foreign portfolio investors. (FPIs) hold 1.29% in Dena Bank, 4.91% in Vijaya Bank and 10.35% in BoB. After the merger, the government will own 65.74% in the merged entity. Experts said that the share swap ratio has taken into account how Dena Bank has performed in the past couple of years, with bad loans ballooning to 23.64% in the September quarter, compared with 5.86% and 11.78% of Vijaya Bank and BoB, respectively. “The share swap ratio is negative for both Vijaya Bank and Dena Bank. There could be a marginal negative reaction to both the stock prices now. On a net worth basis, it is more a negative ratio for Vijaya Bank," a banking analyst said on condition of anonymity. “Also, the share swap ratio for Vijaya Bank is lower than street estimates. However, it is definitely beneficial for Bank of Baroda." Asutosh K. Mishra, head of research of institutional equity at Ashika Stock Broking Ltd said: “The share swap ratio clearly indicates that the bank merger is in the right direction. On some core numbers though, Vijaya Bank looks better; structurally, Bank of Baroda is stronger and that premium must go to Bank of Baroda." Dena Bank’s capital adequacy ratio stood at 10.1% on 30 September, Vijaya Bank’s at 13.56% and Bank of Baroda’s at 11.88%. The branch network of the combined entity will be close to 9,500. While Dena Bank has been placed under the prompt corrective action framework by the Reserve Bank of India, with restrictions on lending, Vijaya Bank is among the only two state-run lenders to have reported a profit in 2017-18. Ashvin Parekh, managing partner of Ashvin Parekh Advisory Services, said the share swap ratio was quite fair, considering the financial position of Dena Bank compared with that of the other two. “There is always some gap between how the market perceives the value of equity and how the merchant banker does after financial due diligence," said Parekh. On 17 September, the government had announced its decision to merge the three banks. The merged entity, comprising two relatively stronger banks and a weak one, will be the third-largest lender in India after State Bank of India and HDFC Bank Ltd, with a total business of over ₹ 14.82 trillion. Since the announcement, Dena Bank’s shares have gained the most at 12.54%. But shares of Vijaya Bank and BoB have both declined since 17 September. Finance minister Arun Jaitley had said the government had been careful in not merging weak banks. “Two strong banks can absorb a third bank to create a globally competitive bank, he said. “No employee will face any adverse service conditions after the amalgamation." The government earlier set up an alternative mechanism comprising Jaitley, defence minister Nirmala Sitharaman and railways and coal minister Piyush Goyal, as an approval framework for proposals to merge state-run banks. BoB said a panel had been set up to address the grievances of minority shareholders, defined as those who individually or collectively hold at least 1% of the total paid-up equity capital of any of the three banks, or constitute 100 shareholders acting collectively of any of the three banks.